It’s time for a brand new workout! This is a Total Body Workout and Fat Burn. I included a warm-up in the video, and posted a separate cool down video below. That will make it easy to repeat the workout, and add the cool down when you are ready. 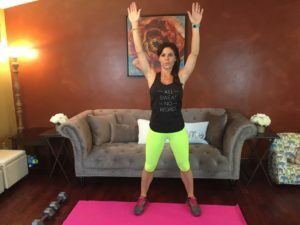 Equipment: You can grab two dumbbells and a chair (or something you can put a foot up on) for this workout. 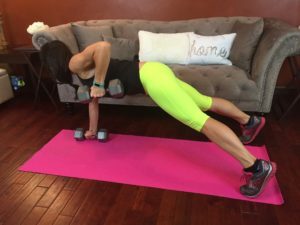 If you aren’t ready for the added weight, you can complete the exercises with body weight only. Select the challenge that is right for you. I used 20 pound dumbbells in this video. 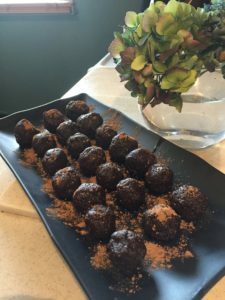 Recipes: I added a new Healthy Dessert Recipe on my blog. I shared it previously on Instagram, but also wanted to post it here so it’s easy to bookmark. You can find the recipe here: Healthy Chocolate Bites: Raw, Vegan, Delicious. This is Workout #5 in my #BFFitFall Workout Challenge. Let me know how you like it! 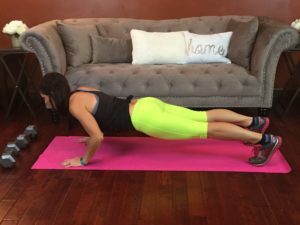 Are you following the challenge, or did you just try out this workout? Your input helps me decide how to structure future workouts and challenges so be sure to leave a comment and let me know what you think. We have had a lot of help this week with friends baby sitting our son so that we could film new workouts. Maverick loves working out with me. 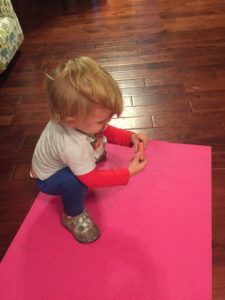 As soon as we were done filming he ran to the yoga mat to practice his Down Dog Pose and Squats. I love that we are able to expose him to healthy habits from a young age. Have fun with today’s workout! I hope you enjoy it! Do you ever post any TRX videos? Thank you for posting these awesome workouts I actually have time for! Done all 5 workouts! !…sweat and sore!!.. I’m glad you’re feeling better! Welcome back! Hi Melissa! I have been following your blog for years now. 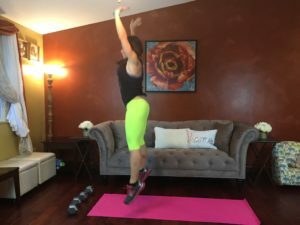 It has been a huge blessing for me to be able to do workouts at home for no cost. I enjoy the new set up that you have adding in the warm up to the video. It is really nice to just hit play (because 99% of the time I would hit play and forget to want up). You are a huge inspiration! Thank you and your family for the sacrifices you make to provide these free fitness videos. Looking forward to continued workouts old and new! Thank you so much Anna. 🙂 I appreciate the feedback, and your support. I look forward to trying This, thanks so much! I am doing your October workout challenge but I bunch up the workouts on days I have more time. Perfect! I love that you are making it work for your own schedule. When jumping jacks feels like a break… Love the workout. I can’t seem to keep things tight when I do jumping jacks. Still working on tightening my core after 4 kids and 6 years of working out. You can substitute a different cardio move instead of jumping jacks. 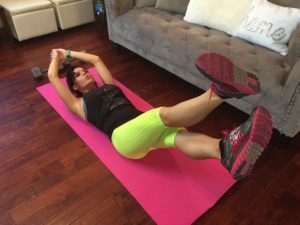 🙂 Even if you don’t have an ab separation you might want to try my Diastasis Recti Core workout. 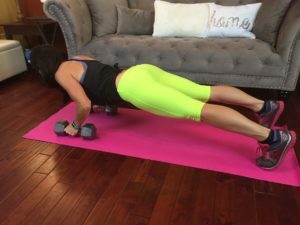 It works the core from the deep muscles outward to help pull everything back in. ohhhh this one looks great. I look forward to doing this in the morning. Thanks for putting it together. I havent tried this one yet, but it’s on the agenda for tomorrow. I love the inclusion of a warm up in the video as I am always lazy when it comes to warming up. I also liked the preview of the next exercise during the cardio burst that you did in your previous video. It’s very helpful to know whats coming, particularly if it’s a new move. Thanks! 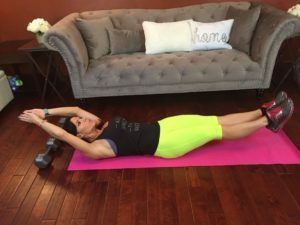 This is one of my favorite workouts you’ve done! I’m dripping in sweat! 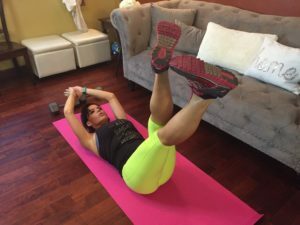 Thank you for helping me dig deep to find my postpartum motivation! 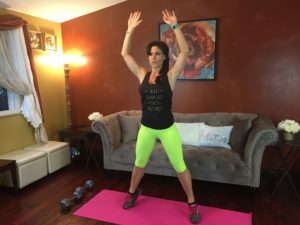 This was a fantastic workout–dripping sweat!! Thanks Melissa! Loved the workout! 2x though plus stretch and feeling great. I have to comment on what a graceful stretcher you are. You look so darn pretty and flexible. I, however, look about as graceful as that hippo ballerina in the Disney movie from back in the day??!! Yeah. Even my husband gets a good laugh. I did work out two and four together for a complete workout. Thanks for all the work you put into making these videos. Love it! !